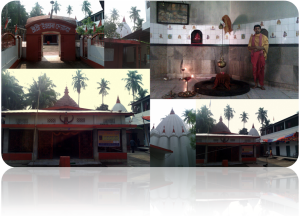 Ugratara and Shiva temples are twin temple in Uzan Bazar Guwahati. Ahom King Shiv Shingha has built it in 1725. After Earthquake of 1897 it was rebuilt. Ugratara shakti peeth is believed to be at the place of fall of naval of Devi Sati. There is a tank on the back side of temple known as Jorepukhuri. This is well maintained worshiped by priests and visited by devotees in large number.